Irena headquarters ... Four-Pearl rating. UAE-BASED renewable energy firm Masdar has announced the successful completion of the new global headquarters of International Renewable Energy Agency (Irena), a 31,983-sq-m multi-use complex located in Abu Dhabi. 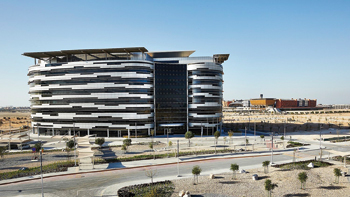 The Irena global headquarters complex, which comprises three connected buildings, will be the permanent home of Irena as well as other commercial tenants, said a senior Masdar official. Located in Masdar City – the low-carbon, sustainable urban development in Abu Dhabi – Irena will officially move in by the end of the first quarter of 2015, said the official. The Irena global headquarters is the first office building in Abu Dhabi to be awarded a Four-Pearl Estidama construction rating certificate by the Abu Dhabi Urban Planning Council (UPC). The Estidama Pearl-rating system, created and managed by the UPC, is the Arab world’s first sustainability rating system designed to assess the sustainability performance of buildings, communities and villas. The building complex, which is united by a common atrium and a single rooftop, conserves energy and water and creates shared space. The atrium connects offices to open spaces where people will be able to shop, to dine and experience the modern, sustainable lifestyle exemplified by Masdar City, said Masdar CEO Dr Ahmad Belhoul. Dr Belhoul further said the Irena headquarters complex includes 1,000 sq m of rooftop photovoltaic panels to generate electricity, while solar-thermal water heaters supply 75 per cent of the estimated total annual hot water usage. Sustainable design strategies are anticipated to reduce the building’s energy consumption by more than 40 per cent and water by 53 per cent, compared to a non-Estidama baseline building, he added. Fitted with sun-shielding fins, the outer skin of the buildings reduces solar heat gain without obstructing the view from inside. High-performance tinted glass and high-efficiency insulation are also used to optimise energy savings. Materials used during construction include locally sourced, low-carbon cement as well as recycled steel.